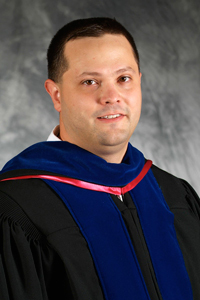 Dr. Nathan Griffith (Class of '95) is Associate Professor of Political Science. He joined the department in 2003 and holds degrees from Indiana University (Ph.D.) and the University of Virginia (M.A.). Dr. Griffith's areas of teaching and scholarly expertise include constitutional law, European politics, political economy, and methodology.